This short spur leads from the Albany rail yard to an unused loading dock near Hill Street. 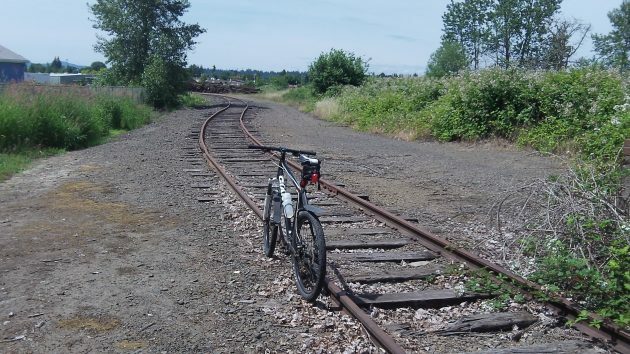 Ever wonder about finding new uses for railroad tracks that are no longer needed? Not short little spurs in industrial zones like the one in the photo, but longer ones on scenic routes? A couple of months ago I came across reports of a new venture in Tillamook on the north Oregon coast. The name is Oregon Coast Railriders. During the summer it affords people the opportunity to pedal four-wheeled, two-seat carts along an inactive segment of the Port of Tillamook Bay Railroad. The trip is from Bay City to Tillamook. For $20 per person 12 and older, you can make the two-hour, 11-mile round trip. This shot is from the Oregon Coast Railriders website. The people running the business have a similar program on the historic Joseph Branch Railway in the Wallowa Valley in eastern Oregon. Riders there can enjoy fantastic views of wildlife and nature in general, just as they can on the ride on the coast. They also get a workout from all that pedaling. Apparently it’s not too strenuous, though. In the publicity photos available online, the pedal-powered vehicles look light enough to be easily propelled. And the track is almost perfectly level, with no grade greater than 1 percent. Benton County might have been able to help set up something similar when, in 2013, it paid $486,000 for portions of the old Southern Pacific’s abandoned Bailey Branch from Corvallis south to Monroe and from Alpine Junction into the hills to Dawson. But the county bought only the land. The railroad, the Union Pacific by then, had the rails and ties taken up for scrap. So that chance — for something like “Willamette Valley Railriders” — is gone. Too bad, especially because the little town of Monroe is always crying for some kind of economic boost. A seasonal business catering to rail fans and nature lovers might not be much, but it’s something. Yes! This is intriguing. Read an article in the Oregon Coast mag while in the dentist’s lobby recently. Nice mini-vacation idea! Back to the inter-tubes to learn more. Small business possibilities such as this? At the time, that would have taken some imaginative thought combined with a dash of sales for BC to negotiate track inclusion. 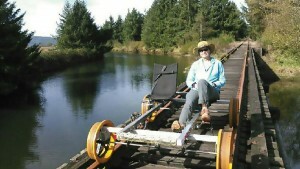 Turn the Bailey Branch into a Rails to Trails, like Banks-Vernonia, hh! That’ll draw more folks down to Monroe than pedaling on rails. Reminds me of the canal system in the UK. Built at the start of the industrial revolution, it served to transport goods and materials all through England and Wales. The railroad made it obsolete and it fell into disuse and decay, but was restored as a tourist venue for “narrowboats.” Now natives and tourists alike enjoy quiet, slow, relaxing touring on the canals. You can even hike the old towpaths, but you must be careful not to outpace your boat if you’re also cruising. Nice variation on a speeder. Hope they develop a market. By the way, I like your self-balancing cycle.